More than 130 Southern University Ag Center staff, SU Baton Rouge campus students, employees and members of the Baton Rouge Community filed into the SU Ag Center on Oct. 13 for the American Heart Association’s (AHA) Hands-Only CPR Mobile Tour. The tour, which is FREE and open to the public, is a part of the AHA’s nationwide Hands-Only CPR campaign which teaches Americans how to perform CPR in the event of an emergency. According to the AHA, cardiac arrest is a leading cause of death with over 326,000 out-of-hospital cases occurring annually in the United States. When a person goes into sudden cardiac arrest, their survival depends on receiving CPR immediately from someone nearby. Studies have shown the Hands-Only CPR method is equally as effective as conventional mouth-to-mouth CPR, and people are more likely to feel comfortable performing it. The training teaches individuals to how to recognize someone who is in need of CPR, to call 911 for help and to push hard and fast in the center of the person’s chest until help arrives. Participants practice CPR on inflatable mannequins during the first session on the CPR training. Attendees also received their own CPR Anytime kit which included an inflatable mannequin to practice on during the training. “I have taken a CPR training before but this one was different because I get to keep the CPR Anytime kit and take it home to teach my mom and my siblings,” said Southern University student Ebony Isabella. 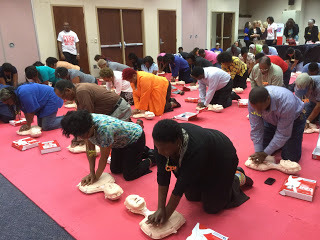 The AHA’s Hands-Only CPR Mobile Tour is funded by an educational grant from the AmeriGroup Foundation. The 2012-2014 mobile tour has trained more than 48,000 to perform Hands-Only CPR. To learn more about the Hands-Only CPR campaign and get ready to save a life visit heart.org/handsonlycpr.